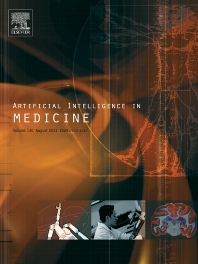 Artificial Intelligence in Medicine publishes original articles from a wide variety of interdisciplinary perspectives concerning the theory and practice of artificial intelligence (AI) in medicine, medically-oriented human biology, and health care. Artificial intelligence in medicine may be characterized as the scientific discipline pertaining to research studies, projects, and applications that aim at supporting decision-based medical tasks through knowledge- and/or data-intensive computer-based solutions that ultimately support and improve the performance of a human care provider. • Strong novelty of method and theory related to AI and computer science techniques. Artificial Intelligence in Medicine papers must refer to real-world medical domains, considered and discussed at the proper depth, from both the technical and the medical points of view. The inclusion of a clinical assessment of the usefulness and potential impact of the submitted work is strongly recommended. Artificial Intelligence in Medicine is looking for novelty in the methodological and/or theoretical content of submitted papers. Such kind of novelty has to be mainly acknowledged in the area of AI and Computer Science. Methodological papers deal with the proposal of some strategy and related methods to solve some scientific issues in specific domains. They must show, usually through an experimental evaluation, how the proposed methodology can be applied to medicine, medically-oriented human biology, and health care, respectively. They have also to provide a comparison with other proposals, and explicitly discuss elements of novelty. Theoretical papers focus on more fundamental, general and formal topics of AI and must show the novel expected effects of the proposed solution in some medical or healthcare field. Methodological, philosophical, ethical, and social issues of AI in healthcare, medically-oriented human biology, and medicine. If you are considering submitting to Artificial Intelligence in Medicine, make sure that your paper meets the quality requirements mentioned above. English exposition must also be clear and revised with due care. Authors are kindly requested to revise their manuscripts with the help of co-authors that are fluent in English or language editing services before submitting their contribution. Papers written in poor English are likely to be rejected. The mere application of well-known or already published algorithms and techniques to medical data is not regarded as original research work of interest for Artificial Intelligence in Medicine, but it may be suitable for other venues. PhD projects: Early publications about more recent research trends, having the goal of allowing PhD candidates to explain their PhD research project and to share it with other scientists interested in the topic. Such type of papers should focus on the overall goals and approaches of PhD research projects, without considering in detail the specific scientific results obtained, which would be the focus of other research articles. Special Issues are regularly published and included among regular issues. Artificial Intelligence in Medicine is looking for special issues about current theoretical/methodological research or convincing applications related to AI in medicine. Special Issues compiled by one or more guest editors who are outstanding experts on the selected topic. Artificial Intelligence in Medicine does not publish conference volumes or conference papers. However, selected and high-quality research results presented earlier at conferences may be published in Artificial Intelligence in Medicine, in the form of a thoroughly revised (rephrased) and extended (including new research results) original research paper. Information for authors and further details about the editorial process can be found in the Guide for Authors section of the Artificial Intelligence in Medicine web page.